Sign up with your email address to receive special offers and exciting WBB updates! The first World Baseball bat was a hand-turned 34-inch ash bat, made in our workshop in Hermosa Beach, California. The need to fulfill custom and team orders at high demands led us to open a second facility in San Gabriel, California. Today Maple, Ash, and Birch woods are used daily to make multiple bats for youth, amateur, and professional hitters throughout the world. 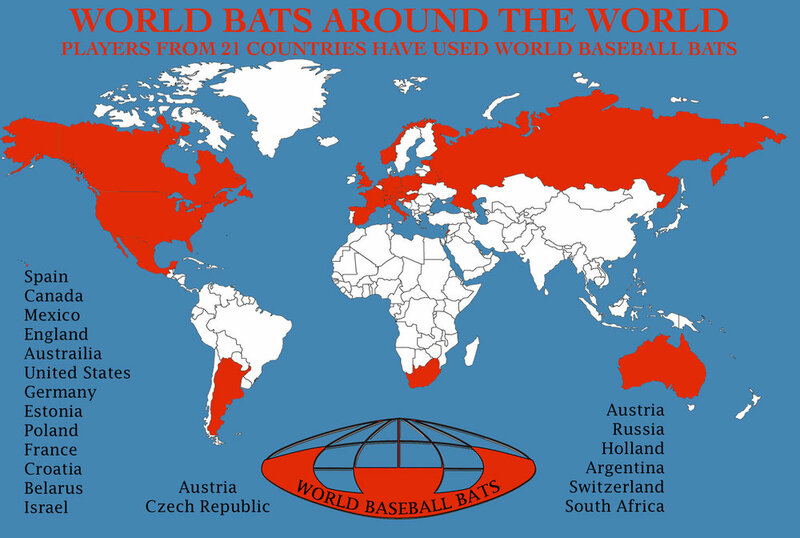 Hitters in many different countries, including the United States, Mexico, Germany, Poland, Spain, England, South Africa, Czech Republic, and Canada, have used World Baseball bats. Our goal is to continue to provide hitters around the world the ability to swing impeccably-crafted, premium baseball bats that outperform all other bats in baseball. 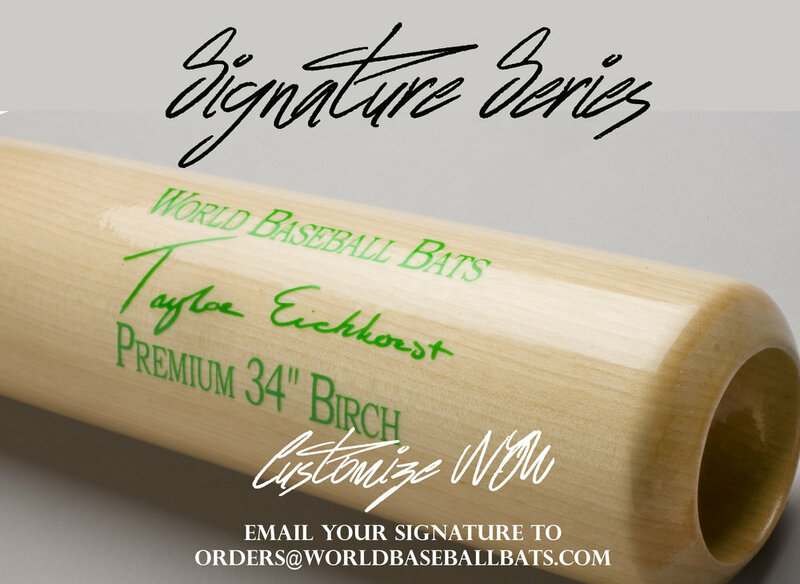 Every bat from World Baseball Bats is customized for our customers. Our hand-turned bats are made from the best lumber in the United States. Each bat is chosen from our stock of hand split billets. Split wood is far superior to the most commonly used sawn lumber because it ensures that the wood grain will be straight, providing optimal strength and durability. World Baseball Bats prides itself in being able to make the perfect bat that looks and feels great for our customers. Have you ever picked up two different 33-inch, 30-ounce bats that have felt completely different when you swing them? That is because just length and weight alone are not enough to truly determine the proper bat for a player. World Baseball Bats has created a unique system for measuring the weight distribution of a bat. The World Baseball Bats Ratio takes into account several factors, such as the wood density, volume, and center of gravity of each bat model. Discerning players can actually find the bat that feels perfect and know that in their future orders they will receive identical bats. Each swing a player takes must be made with the confidence they can get the barrel through the zone and make good contact with the ball. Our bats can be customized however you like. Hitters can choose any color for their bat and have their name, school, or team added to the logo. If you don't see a color you like from the options, please email us and we will make your bat look exactly how you want. We stand by every World Baseball Bat we make. Each bat is hand-crafted and we take special care to only use the highest quality premium wood, but the nature of any natural product is that undetectable imperfections can compromise the integrity of a bat. Therefore, if breakage occurs within the first 30 days of receipt, under the guidelines set forth below, we will replace the bat free of charge. Applies only to World Baseball Bat Elite and Professional Models. Hit ONLY regulation hand-thrown baseballs. Never hit dimpled batting cage balls or heavy water-logged balls. The hitting surface must be between one inch above the World Bats logo and one inch below the end of the barrel. Contact MUST be made with the World Bats logo facing directly up or directly down. NEVER hit your spikes with your World Baseball Bat. NEVER leave your bat in a hot car, garage, outdoors, or any other area where weather can affect the integrity of the wood. NO modifications, such as sanding the handle, can be made to your World Baseball Bat. Once the bat, birth certificate, and online claim have been received, if the broken bat falls within the appropriate usage guidelines, we will make and send a replacement bat right away. Any questions can be sent to mike@worldbaseballbats.com. World Baseball Bats donates 20 percent from every pink bat order to breast cancer charities. Think Pink bats are painted pink to honor the brave women in our lives with each swing we take. Have your Think Pink bat customized with the name of an important woman in your life.